This is our daughter Cassidy. She’s 11 now and making a goofy face in this picture, but I wanted you to see her straight teeth. They’re completely free of decay, too, but I’ll get to that in a minute. When Cassidy was a baby, I got my hands on a copy of Weston Price’s book, Nutrition and Physical Degeneration. (He’s the dentist/researcher I told you about yesterday.) In it were glowing pictures of indigenous people who had been raised eating a traditional diet, all of them cavity free, and each with a mouthful of beautiful straight teeth. I SO wanted our kids to have mouths like that! But Tim and I both had really messed up, crowded teeth (despite extensive orthodontic work during our teens). 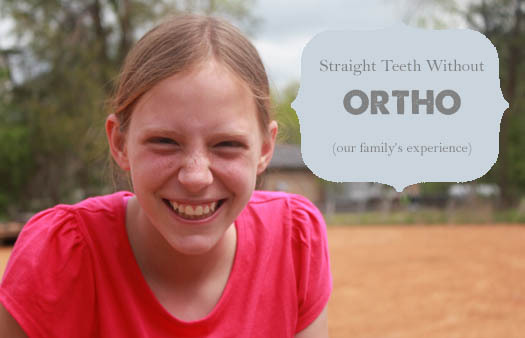 So even though we decided to raise our family on traditional foods as much as possible, we really didn’t think our children would end up with straight teeth. We thought it would take generations. In addition to a nutrient-dense diet and little or no processed foods, we stayed as consistent as we could with two supplements that I credit for making a big difference in our children’s teeth. Why Cod Liver Oil & Butter Oil? Most people recognize that our bones and teeth require a liberal amount of minerals to develop properly and stay healthy. Phosphorous and calcium in particular were at least 4 times more abundant in the diets of the people groups Weston Price studied than in the typical American diets of his day. Dr. Price recognized, though, that even if we are eating foods high in minerals, our bodies are unable to utilize the minerals without the presence of certain fat soluble activators; vitamin D, A, and one that he termed “activator X” which was recently discovered to be vitamin K2. The primitive diets he analyzed were at least 10 times more abundant in these fat soluble activators than modern American diets! So we have made it a high priority to buy good quality cod liver oil and butter oil while our children are growing – and to take both at the same time (together) each day. Remember that we thought it would take generations to gain the wide dental arches and straight teeth we were trying to achieve? Now that our children’s adult teeth have come in, we can see a definite pattern. Our youngest children, who had cod liver oil and butter oil in their diets as babies, have the straightest teeth and the widest dental arches of anyone in our family. Our middle boys have fairly straight teeth, and our oldest’s teeth are most crowded – but hers are at least a little straighter than Tim’s and mine. Just one. (For 5 kids, ages 16, 15, 13, 11, and 9, plus myself and Tim, wouldn’t you say that’s pretty good?) I’d love to tell you a story about how we successfully healed it, but it was a baby tooth, and it fell out just a few weeks after we discovered the cavity. My friend Deborah actually did heal her son’s cavity. So I’ve asked her to tell her story. A few years ago, when my oldest boy was not quite two, I noticed that he had two small cavities in his bottom front teeth. I got to work researching supplements to support tooth health, and cod liver oil came up #1. I began giving him a double dose of cod liver oil, and also added grass-fed ghee, which he just took off a spoon, chewed up, and swallowed (he’s a champ!). I gave him an herbal calcium/mineral supplement for children as well (Dr. Christopher’s kid-e-calc and kid-e-mins). I got in the habit of giving him the supplements every morning, and since I was pregnant and experiencing “mommy brain”, I forgot the reason I was giving him the supplements in the first place! Three months later I checked his teeth and there was no sign of a cavity. That was all I needed to convince me that supplements ARE effective, and the human body has an incredible ability to heal itself when given the proper nutrients. Now I give all my boys cod liver oil daily, and ghee and the calcium/mineral supplements during the winter. Three years later and so far no more cavities! I know you want the absolute best for your family. And adding a small amount of cod liver oil and high vitamin butter to your family’s diet can greatly help their teeth and bones! 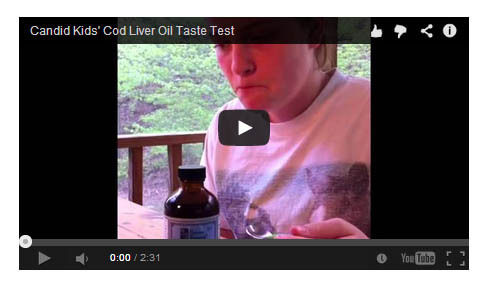 If you’d like your family to start taking these excellent superfoods, but the words “cod liver oil” make you gag, you’ll want to take a look at this video we made of young children and older teens tasting one of the flavored cod liver oils for the very first time. You’ll get a candid first impression from each of them. And be sure to order your family some of these incredible superfoods now. You’ll find both the cod liver oil and high vitamin butter oil on these two order forms. Have you ever used cod liver oil? What has your experience been? 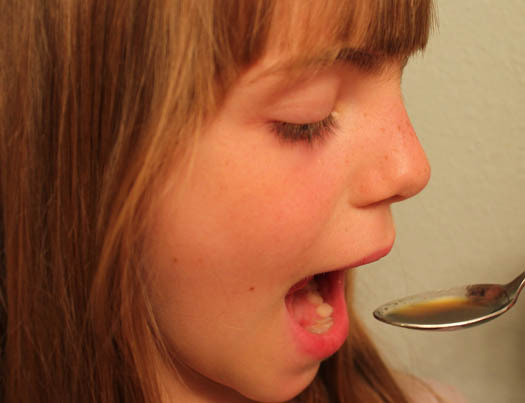 Do you use cod liver oil or butter oil regularly? Have you seen an improvement in your family’s teeth? Post your questions or comments below. We read every comment. If you liked this article, or if you think it would help some of your friends with their families, share it on Facebook. P.S. Let me emphasize that this has been OUR experience. I know there are families who haven’t taken special care to eat one way or another, yet their kids are fortunate enough to develop straight teeth free of decay. And on the other hand, there are families that eat everything they should and nothing they shouldn’t, but they still make trips to the dentist each year for fillings and orthodontic work. That said, I’m confident that we were not visited by the straight-tooth fairy or the other tooth fairy who keeps cavities away. These were results that we went after with deliberation, and you can do the same. I Straighten Teeth, Sharpen Vision, and Create Beautiful Clear Skin. What Am I? As adults, is it important to take this as well or should we just focus on our children whose teeth are still growing? I know adults can get cavities, but from a financial standpoint, would it be better for me to focus on these supplements for my children? Tara, It is important to take cod liver oil as adults, especially for us ladies during our child-bearing years. Several adults I know have even reversed their cavities, stopped the need for root canals, and alleviated the pain of abscessed teeth, actually saving money at the dentist. So if you have it in your budget, yes, it’s definitely worthwhile to take Cod Liver Oil and Butter Oil as adults. But since children’s bones are still growing, it will benefit them more than it will us. So if your budget is limited, it’s more important to focus on your children.